I took on the mantle of leadership for the Päck in October of last year. It was quite unexpected. Nymaway had made a few sudden decisions. One day we were carrying on as usual and it felt like the next day Nymaway was messaging me to sign on during my lunch break to RP out the transition. As cliche as it sounds, that feels like it was yesterday. This transition was not smooth, at least to me. I had no idea what to do and I immediately called an officer meeting. That meeting was also not very smooth, but we worked together. Sure things have changed a lot in my time, and some things have stayed the same. 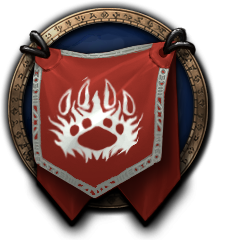 I won't claim to be the best guild leader, but I am proud of what we accomplished with me at the helm. I thought when I came to this point it would be much later, and I would also be dreading it. Even though my time was short I must say I am ready for it to be over. I don't mean that in the negative sense of "God I can't wait for this crap to be over!" But more a sense of peace with it. I am happy and confident that passing things on to Laernyx will be a great decision for the Päck. I want to thank everyone in this guild, and those of Clan Battlehammer if they ever see this. You guys are what made the work worth it, and I had a lot of fun. I also want to thank everyone for always treating me with respect. It seems small, but it meant a lot to me. I know you guys will give Laernyx the same courtesy. I will still be here, always doing what I can to help the guild, but I will also be playing other characters and I will have much less time for World of Warcraft. My only promise on my availability is that I will try to be on for every raid night. I look forward to stepping back and following someone else's lead once more.